A home to over 3,140,000 books, with a copy of every book ever published in the State, The Sir Seshadri Iyer Memorial Library or the State Central Library is nothing short of iconic. 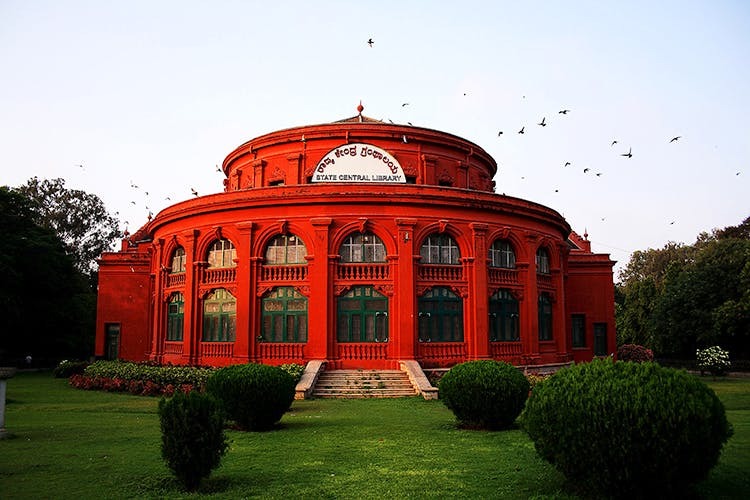 With its instantly recognisable bright brick red walls and its central location within the lush green of Cubbon Park, this is one of the city’s biggest cultural sites and landmarks. The biggest library in the State, its shelves are packed with everything from periodical publications to books in braille, so if it’s knowledge you seek, you’ve come to the right place. The library’s brick red walls have seen over a century (103 in 2018) of growth and change in the city and have their own story to tell, apart from the many in their books, that is. Looking for a quiet spot with easy access to information, to hit the books? Well, this is it! Free from distraction and stress, the State Central Library is where you can bury your head deep in those books and prepare for whichever competitive exam it is you have to ace. These walls have seen the hopes and hard work of many an IAS and KAS aspirant. And like we mentioned, the place is stocked up on plenty of academic books, research material and rare periodicals that you can get your hands on and read through. And any time you want to take a study break, Cubbon Park is right outside. Pack yourself a picnic and have a perfectly productive day with books, culture and greenery in the heart of the city. Open from 8.30am to 7.30pm, we highly recommend paying it a visit during the weekend. It's a reference library, so don't go there expecting to borrow any books.